Named after the famous Russian ballerina, pavlova is one of the most elegant desserts you can serve. The addition of Brie transforms it into a dessert-and-cheese course that’s neither too sweet nor too filling. 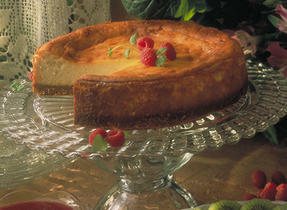 In an electric mixer, beat egg whites with vinegar until stiff peaks form. 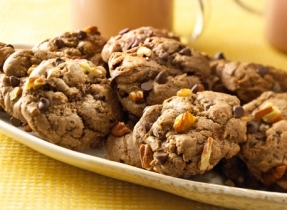 Add cornstarch, cardamom and ¾ cup (175 mL) sugar and continue beating for about 5 more minutes. Transfer mixture to the baking sheet and form 6 or 8 circles about 3½˝ (9 cm) in diameter and ¾˝ (2 cm) thick. 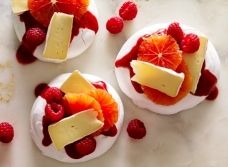 Top meringue with strawberry coulis, orange slices, Brie and raspberries; serve immediately.